Are you someone who is travelling a lot in pollution everyday? Do you live in a city where dust and pollution are high? Do you have very oily skin which attracts dirt and grime like a magnet? Then, read on, for I have the perfect product for you 😀. Today, I will be reviewing Mitti Se products which I got recently. I have already reviewed Mitti Se Wild Essence Face Wash which I totally loved. 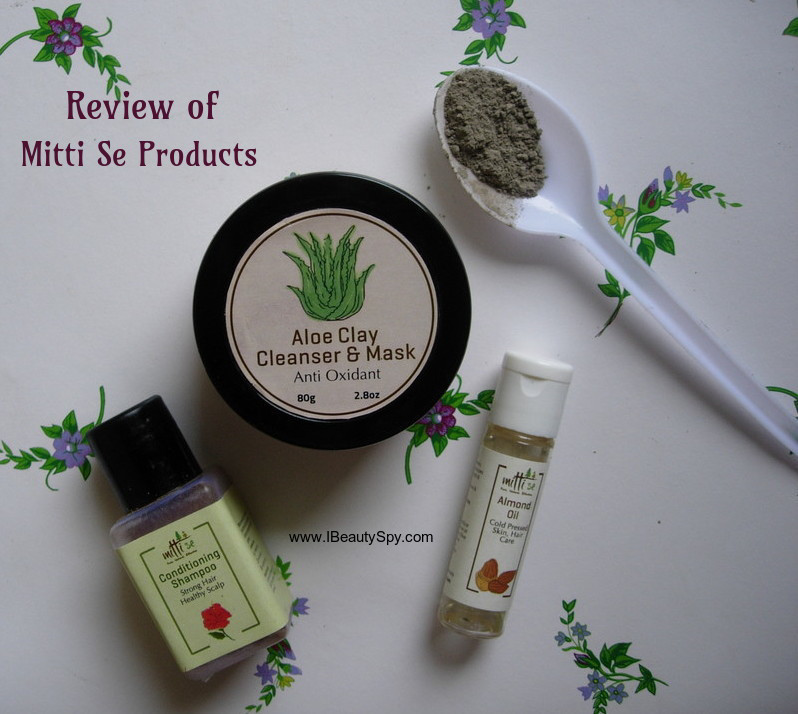 In this post, I will review Mitti Se Aloe Clay Cleanser & Mask and couple of samples which I received along with it. Let’s get on with the reviews. This is an effective cleanser, invigorating and healing. Prepared using nutrient rich river bed mud from the Rain forest of Central India by an elaborate process, the mud is soaked in Aloe Vera juice several times until completely saturated. It is then strained, cleaned and made into fine powder. It removes toxins, nourishes, moisturizes and stimulates natural healing. It is mineral-rich with vital nutrients for skin. It improves the look of skin by improving elasticity, minimizing pores, wrinkles and lines. As the mask dries, toxins that may be present deep in the skin cells are drawn out, leaving the skin feeling clean, revitalized and refreshed. It can also be used as a mild cleanser – suitable for sensitive skin and can be used instead of soap for daily cleansing for Adults or Babies. It can also be used as a Shampoo for Babies hair. We prepare and sell our masks as a dry product with no moisture whatsoever. This allows them to be 100% natural and pure, with no preservatives. You can use plain water, rose water, egg white, yogurt or honey to prepare a mask that suits your skin type. Mitti Se Aloe Clay Cleanser & Mask comes in a tub packaging with a lid in between for protection. On opening, the tub was filled till the brim with powder. Talk about brands where you open and see only half of the tub filled with product and feel cheated. The tub filled to the brim really made me happy. Mitti Se Aloe Clay Cleanser & Mask is black in color similar to clay. It has a very fine powder consistency. The scent is the best part. It is very earthy and natural, just like river bed mud. Whenever I use this, I feel like am sitting on the banks of a running river surrounded by the fresh, earthy smell. Mitti Se Aloe Clay Cleanser & Mask is a 2-in-1 product and can be used both as a cleanser and mask. I use it once a week as a mask and thrice a week as a cleanser. If you have oily skin or facing lot of pollution, you can use it daily also. Very little quantity needed each time, so believe me this tub will last you for 1.5-2 months atleast. I take a quarter teaspoon in my palms, mix it water and cleanse my face with it. It instantly attracts all the dirt, grime like a magnet and detoxes skin completely. My skin feels refreshed, soothed, so clean and soft. When I apply my toner after this, not even a single dirt comes on the cotton swab, which is usually the case with other face washes. Since it is infused with aloe vera juice, it doesn’t dry skin too much. But if you have very dry skin, I would advise you to use only 3 times a week. For dry skin like mine, Mitti Se Wild Essence Face Wash works amazing. 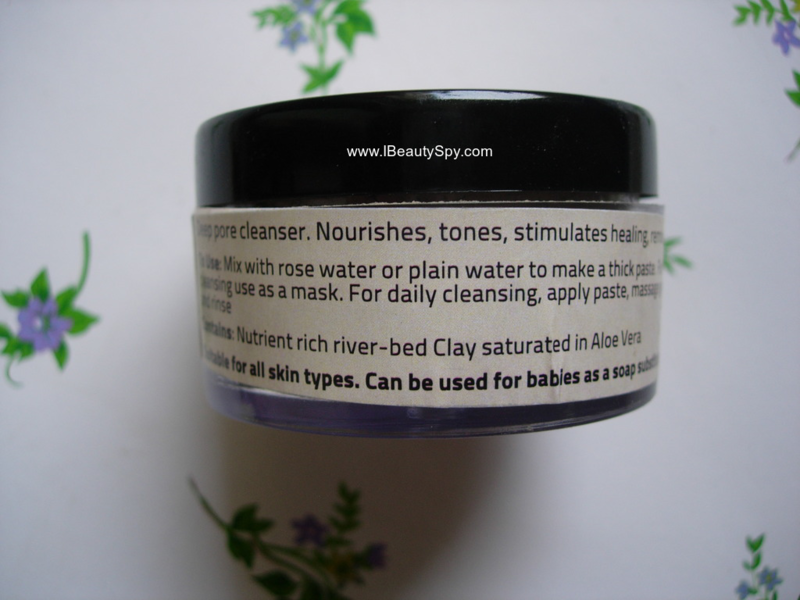 But I would still like to use this Aloe Clay Cleanser few times a week for detoxing the skin. And if you are facing lot of pollution everyday, I would highly recommend this as it would completely remove every tiny trace of dirt, dust and grime. Mitti Se Aloe Clay Cleanser & Mask also works very well on acne. I once had a pimple and after cleansing my face with this, it shrinked to half. I also observed that my pores have been minimized with regular use. The texture of my skin has improved a lot and my skin feels tightened and smooth. I can’t comment on its effects on wrinkles and lines as I haven’t noticed any such thing. I got this as a sample with my order. After cleansing my face with Mitti Se Aloe Clay Cleanser & Mask, I take 3-4 drops of Mitti Se Cold Pressed Almond Oil and dab over my face. It has made my skin healthy, soft, glowing and nourished. As we all know almond oil is rich in vitamins and great for the skin and this one from Mitti Se is pure and cold pressed. So definitely give a try. This is also a sample product I received. It is an all-natural, powder-based hair cleanser containing gooseberry (amla), fenugreek (methi), shikakai, hibiscus, natural surfactant and grapefruit essence. I have used it just once. It cleanses hair well without drying it. I don’t need a separate conditioner post-wash. If you like powder-based hair cleansers, do give this a try. * Handmade and 100% natural, no preservatives, colors, fragrance. * No animal testing and vegetarian. * Detoxifies and deep cleanses every single dirt and grime. * Improves texture of skin making it smooth. * Very soothing and calming natural earthy scent. * Very little quantity needed each time. Yes, its great value for money. Finally, kudos to the Mitti Se team for creating such a wonderful product. Mitti Se Aloe Clay Cleanser & Mask is a very effective product at a very affordable price. I would highly recommend it to everyone. Their products look worth trying. Yes. I love the fact that we can get such good quality, natural, handmade products at affordable prices. After reading your review, I want to try the cleanser! 😃 And I do have oily skin. wow these are amazing natural products. Want to try them out. mitti se products are one of the best I tried in my life, they deliver what they claim, I used almost every product of theirs and its worth the money.